The program uses a three degree-of-freedom model for the design and analysis of mechanical snubbing in elastomeric isolators. All the isolators in the model are supplemented by a snubbing system so as to limit the displacement of the power-train in all three directions of motion. The model is piecewise non-linear and uses normalized Bouc-Wen elements in order to capture the hysteresis of the isolators and the snubbing system, as well as the transition in stiffness and damping properties resulting from the inherent coupling between the isolators and the snubbing system. The model is successful at capturing the strain rate and strain amplitude dependence of the snubbing system. The model can be specifically used as an analytical tool for design iterations and design optimization in order to compute parameters like the snubbing thresholds and stiffness characteristics of the snubbing system so as to satisfy conflicting design requirements like maximizing isolation, limiting transient displacement and minimizing transmitted forces. 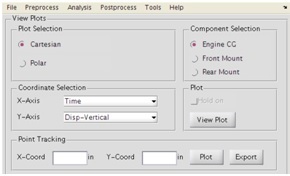 The program allows the designer to compute the displacement envelope around the powertrain at specific locations in order to position other components around the isolated system while avoiding possible intermittent contact with these components, especially in the design of chassis assemblies in automotive applications. Assists designers and engineers in the evaluation of the dynamic characteristics of isolation systems in motorcycles. 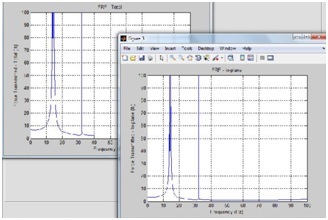 The software evaluates natural frequencies, modes shapes, and the frequency response of the powertrain-isolation system assembly using a six degree-of-freedom model of the powertrain. Each isolator is modeled as a linear tri-axial spring-damper system. The program also counts with an optimization module to determine the optimal stiffnesses and locations for the isolators. 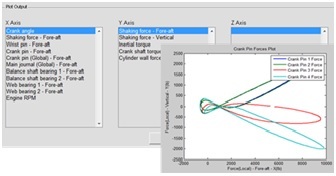 Software tool developed to assist designers and engineers in the analysis of the shaking forces arising from different configurations of engines as well as their design characteristics. It allows the evaluation and impact of design variables such as crank angles, shaking forces, cylinder wall forces, inertial torque, and crank shaft torque, among others.